Sixteen months ago, when the State Equalization Board determined how much money the Legislature could appropriate for the 2014 fiscal year ending this June 30, it certified that the corporate tax would generate $482 million for the general revenue fund. Corporate collections for the previous year were rolling in at an annual rate of about $450 million. The state economy was expanding. Companies were reporting rising profits. Bumping the previous year’s tally by $32 million seemed like a safe bet. Instead, it turned out to be a colossal forecasting error. 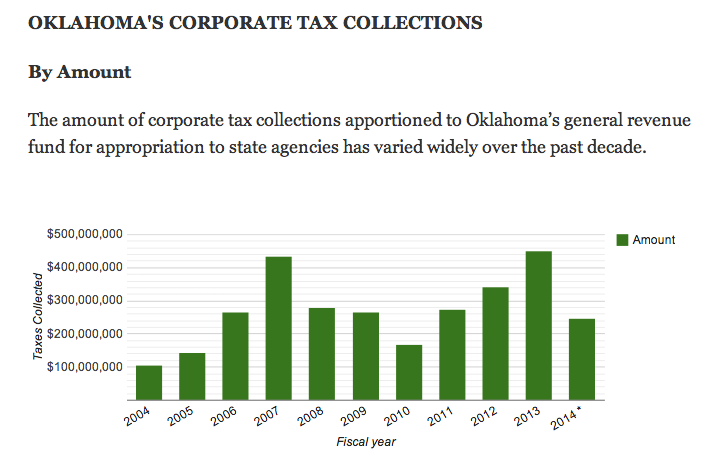 The amount of corporate tax collections apportioned to Oklahoma’s general revenue fund for appropriation to state agencies has varied widely over the past decade. The corporate income tax’s contribution to each year’s general revenue fund budget has waxed and waned from one year to the next. Source: Oklahoma Office of Management and Enterprise Services. * Data is for the first 10 months of fiscal Year 2014, which ends June 30. With less than one month to go in the 2014 fiscal year, it looks like the state will be lucky if it collects $300 million in corporate taxes for the general revenue fund this year, instead of the $482 million it was banking on. The near miss has focused attention on the ability of corporations to reduce their taxable incomes at the same time they report big profit gains to their shareholders. “They’re taking advantage of all the (tax law) structures that are made available to them. That’s what any good business would do,” said State Auditor & Inspector Gary Jones. Although the bad estimate almost triggered what’s known as a revenue failure, “it’s probably more a failure of forecasting,” said State Treasurer Ken Miller. Miller has been meeting with Finance Secretary Preston Doerflinger to develop better revenue-estimating procedures. Their recommendations will be presented to the Equalization Board on June 16. The corporate tax is especially vexing, Miller said. The corporate income tax, in short, has become a highly unreliable revenue stream with the potential to spoil the best-laid plans of budget officials and lawmakers. Oklahoma’s state’s corporate income tax rate has been fixed at a flat 6 percent rate for the past 24 years. But annual collections have bounced up and down to an unpredictable beat that is sometimes out of sync with the economic cycles affecting other tax revenue streams. In the last five years alone, the corporate tax’s contribution to the general revenue fund has oscillated from as little as $168 million one year to as much as $452 million another. It has provided as little as 3.6 percent of the general revenue fund budget to as much as 8.1 percent. State officials and independent analysts who have studied the swings say they reflect the ability of corporations to take advantage of various tax credits, tax deferral strategies and tax-accounting practices allowed by federal and state governments. “This is all perfectly legal and normal,” said Steve Tinsley of the State Auditor & Inspector’s Office in a recent “white paper” report to state officials. Much of the tax law action occurs in Washington. But officials say the state has contributed to the problem by creating a smorgasbord of tax credits over the years, suspending some of them temporarily to boost recession-era budgets, reinstating them later, allowing prior-year refunds and failing to accurately gauge the impact of all the changes. Tinsley said the volatility of the corporate tax could accelerate as companies implement more aggressive strategies for minimizing their tax liability. As an example, he said that oil and gas pipeline companies have been spinning off their revenue-producing assets into master limited partnerships. MLPs, unlike traditional corporations, pay no corporate income taxes. Instead, their tax liability is passed through to the people who buy the partnership units. But Tinsley said most partnership units are purchased by tax-exempt institutional investors, so there is no offsetting increase in personal income tax collections. Jonathan Small, vice president for policy at the Oklahoma Council for Public Affairs, a conservative think tank, said some of the corporate tax’s variability is attributable to frequent changes in federal tax laws and regulations. For example, the prospect of a higher federal tax rate on capital gains prompted some firms to accelerate asset sales in 2012 before the change took effect. That boosted corporate tax collections, but it turned out to be a temporary surge. The subsequent decline should not have surprised state officials, said Small, a certified public accountant and former state budget analyst. “CPAs like myself were being trained to help businesses and individuals reorganize the assets and sell them in sufficient time to avoid the tax increase on capital gains,” Small said in an email. “For whatever reason, special interests, tax consumers and now a growing number of lawmakers who are listening to them don’t understand that people don’t invest and risk capital, nor do they work, to pay taxes,” he said. State Auditor and Inspector Jones said he expects corporate tax collections to remain volatile and to potentially decline over time as companies continue to pressure lawmakers to approve and extend tax credits and incentives. “I think a lot of the decisions we’re making in Oklahoma City tend to be more based more on campaign contributions and lobbyists’ concerns than they are on what’s in the best interests of the citizens of Oklahoma,” Jones said.